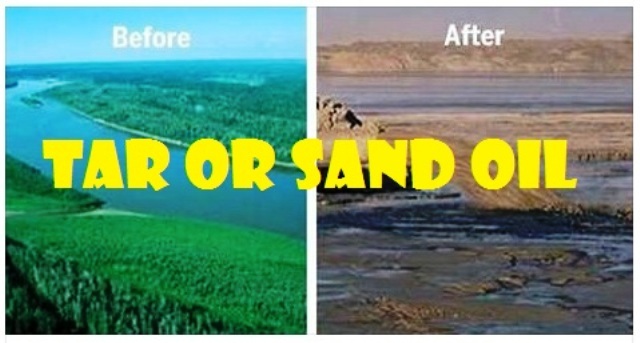 The use of oil sands, tar sands or bituminous sands is, however, without environmental and health impacts. Serious concerns on (1) the considerable amount of water needed to mine oil sands, (2) the fragmentation of wildlife habitat, (3) increased risk of soil erosion or surface run-off events to nearby water systems, (4) green house gas and other air emissions from production activities, (5) mercury contamination, (6) the release of natural gas via flaring or venting in the oil extraction process, (7) the emission of organic substances with potential toxicity to human and the environment, (8) the increased release of hydrogen sulphide, (9) he clearing of vast areas of forest lands prior of actual extraction, (10) the carbon dioxide emissions from oil sand which is 20 to 22% higher than average emissions from petroleum production, (11) the high deformity rates in fish embryos exposed to tar sands, and (12) the increased incidents of cancer cases in areas near tar sand mining operations. With the multifarious problems, issues and concerns attributed to this energy sources, I seriously doubt the righteousness of utilizing tar or sand oil.